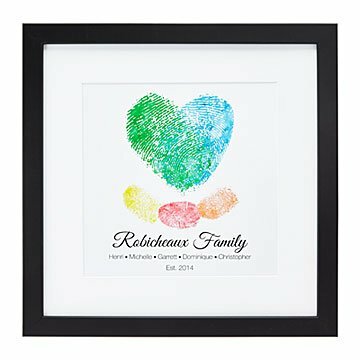 Celebrate what makes your family one-of-a-kind with Amy Evenson’s custom fingerprint art. Two people fell in love, and the rest was a wild adventure. Celebrate what makes your family one-of-a-kind with this personalized artwork by Amy Evenson. Each is customized with your fingerprints, names, a special date, place, and time. Mom and Dad's make a sweet heart in the center to symbolize how it all began. To collect the prints, Amy mails you an ultramodern, clear plastic strip (no ink stains here!. Once she's digitally transferred the prints and turned them into a colorful heart, she safely disposes of your prints. It's a great holiday or anniversary gift that gives any room in your home a bit of love and warmth. Made in Oregon. As a child, Amy Evenson loved camping with her family. One of her earliest memories is sitting by the lake gazing at the stars. She’s still fascinated by astronomy, and has devoted her career—both as a graphic designer and photographer—to capturing the beauty of the skies above. She also enjoys creating pieces dedicated to the bond shared between loved ones. Today, you can find Amy at her studio in central Wisconsin, crafting unique, personalized gifts from jewelry to wall art. Care: Avoid hanging finished print in direct sunlight to preserve color range.